Cold, and windy, but mostly clear – just some high cirrus passing by every once in a while to give the Moon a hazy halo. I tried to capture a timelapse of the whole event – that’s being processed and hopefully comes out well. 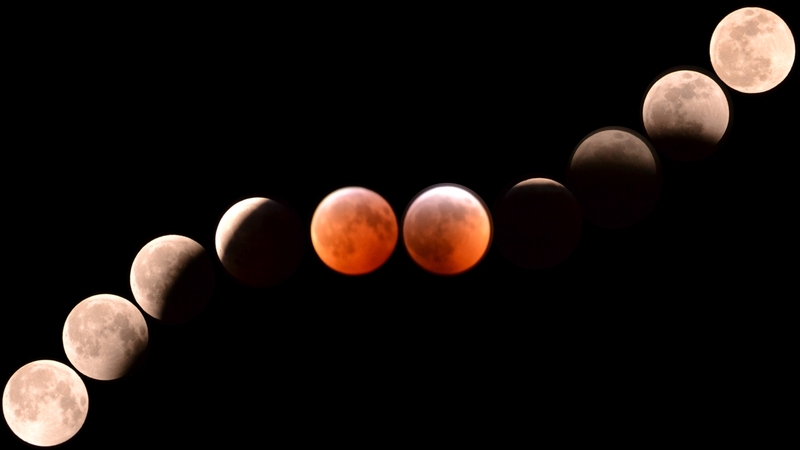 In the meantime, here’s a montage of the eclipse as viewed from the US East Coast. Start in the upper right and move left – this is the direction the Moon was moving along its orbit through the Earth’s shadow. Shots are taken every 20 minutes or so. It was a beautiful event! Well worth staying up for. I keep trying to imagine what this looked like from the perspective of a viewer on the Moon, watching a solar eclipse, but seeing the Earth ringed with red light. Beautiful, I’m sure. Very nice! Great time lapse. It was 0 degrees by me so I didn’t set a schedule for intervals, just was outside taking pictures when I could bear it. I think we were at 11, with a windchill a couple degrees below zero. Downright balmy by comparison! I would run out and take 4 or 5 shots, run back in and set a timer. The actual totality shots were hard, getting a look almost straight up on a tripod for about a one-second exposure, with lots of wind – none of them came out perfectly in focus… but close enough for this kind of presentation! Yeah, focus and pointing near straight up was very hard. It’s hard during pleasant spring nights, let alone frigid January days.